Research shows that spending on corporate training grew by 15% http://www.bersin.com/corporate-learning-factbook-2014 last year. And according to the ABS net direct expenditure by employers on structured training averages $458 per employee per year. So when thousands of dollars are spent to upskill your workforce each year, how do you know if that money was well spent? A structured training evaluation process can help. A well run feedback program can help you to make refinements that improve training for future participants and verify that your training program is adding value. Helps determine if actual training outcomes are aligned with the expected outcomes. When more than 70% of organisations indicate that “capability gaps” are one of their top five strategic challenges, it’s vital that a strong training evaluation and measurement system is in place. to improve your training initiatives. strengths and weaknesses by course or facilitator. Our Project Managers have extensive experience in the set up and delivery of best in class Training Evaluation Survey Projects. Their role is to ensure your survey runs in an efficient and effective manner from start to finish. Easily identify strengths or weaknesses in your L&D program. Filter results by course, trainer, location, department, or whatever variables interest. When your trainees are often away from their desk in remote locations, it pays to have a mobile and tablet-ready feedback solution to ensure you can receive instant feedback while still fresh in the trainee’s mind. 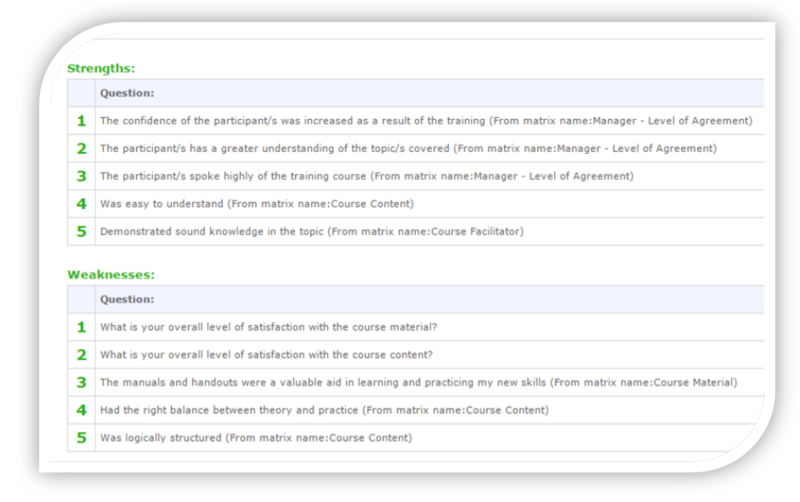 Utilise our proven training evaluation survey templates, or bring your own questions, or use a mix of both. Why waste your staff member’s time by asking them to complete pages of demographic data? PeoplePulse lets you pre-load that infomation. Your survey will be shorter, and you will be able to filter your reports by any data you pre-load. This combination of exceptional software and unmatched support & advice works to ensure that your training evaluation surveys are set up professionally without fuss, and that ultimately your survey delivers you the insight you need to make better business decisions about your L&D function. We have received great service so far from PeoplePulse and would not hesitate to recommend or use them again. Excellent customer service – I always knew where my project was at any given time….well done! You went above and beyond to meet a very tight survey timeframe. 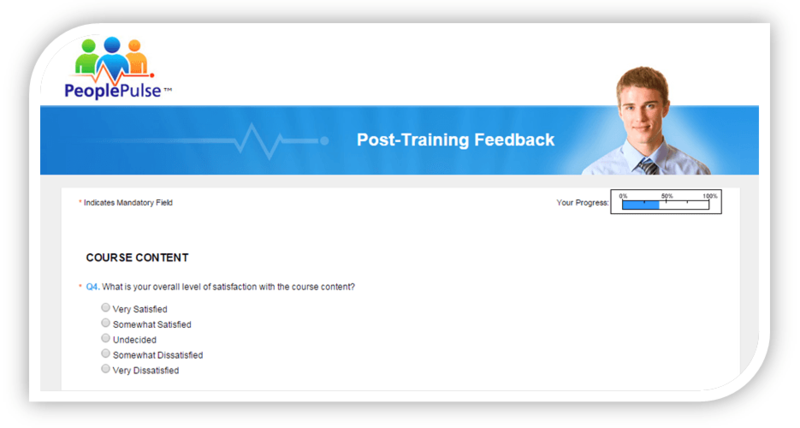 You were accessible when required and offered excellent improvement tips on the actual survey questions. I would happily promote PeoplePulse. Great job guys. Brilliant effort in meeting the very short timeframe we set down.